I'm hard pressed to see how the last 100 days did not give housekeeper Nancy Pelosi a drinking problem, but if her "60 minute" interview from Sunday night is any indication, she agrees well, even though she can't keep one democratic civil war from burning down in the chamber. Here she tries to rinse off the three beginners who have already filed the agenda and embroidered their party in controversy with anti-Semitism. They are, she says, "like five people." 8 seats to 27. And, as I explained last week, the overwhelming majority of Americans indicate progressive pet projects such as legalization of third trimester abortion and abolition of private health insurance. But in Pelosi 's House, "as, five" prisoners drive asylum. One of Pelosi's very maligned "five people", Rep. Alexandria Ocasio-Cortez, DN.Y., bamboosized six senators who drove for the Presidency as co-sponsor of the Green New Deal – a non-binding resolution that would cost $ 93 trillion and not only eliminate air travel but also nuclear power. Senate Majority Leader Mitch McConnell, R-Ky., They called the spooked senator bluffs and forced a vote on the Senate floor. Not a single Democrat voted for it. The co-sponsors of the dissolution now look like fools, and they have to thank "Speaker Ocasio-Cortez". 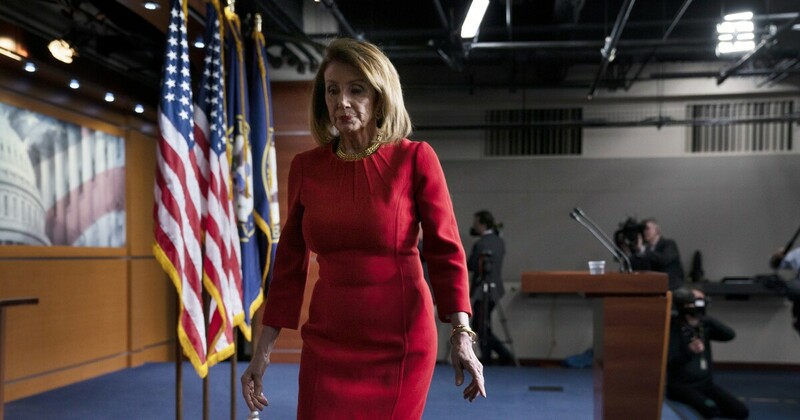 Having become a public support from the nation's democrats to perform President Trump, Pelosi has been working diligently to smother House fervor to vote on DOA impeachment charges. Yet one of those "like five," Rep. Rashida Tlaib, D-Mich. – also the first congressional member to urge the complete Holocaust of Israel's state – still making the cable news to push her impeachment resolution. And no one has caused Pelosi more headache than Rep. Ilhan Omar, D-Minn., Who has been the subject of controversy over the past 100 days to argue that AIPAC and the Jews are using their shekels to control the congress. She has accused American Jews of supporting Israel with double "fidelity" to "a foreign land". She has also called a succession of the globally recognized president of Venezuela, progressive Juan Guaido, an "American backed coup" to "install a very high resistance". She has laughed on video at American fear of al-Qaeda and equated the terrorist organization with the US military. She has been caught on tape referring to 9/11 as "some people did something" while collecting to the Hamas-linked organization CAIR. As with her anti-Semitic comments, she has also doubled on this. Pelosi started his second speakerhood that called Trump's shutdown bluff and made the biggest victory over him throughout his presidency so far. She is sharp as a thank you and as ruthless as she was when she fell Obamacare through the house and down the throat of an audience who didn't want it. Left to her own will she can effectively engage in political ownership and drive an opposition party more in line with the American people than the party in force. But instead she surrenders the tooth to "as five" financial illiterates, who undoubtedly supply the republican party's endless feed, and possibly the 2020 election. It may not be nice for Omar's colleagues to have to wonder and worry about what the next comment will be that Donald Trump and his Twitter feed will wait to blame all democrats for the provocations of one. But by not putting on records about Omar when they could, the Democrats are now bound to her all the time. This problem will worsen, and its political consequences are becoming increasingly expensive for Democrats who want to win national elections and govern the country. Pelosis's shadow is satisfactory to look at, but when it comes to shots, she fails completely and completely fails to sip the Democratic Party's escalating flirtation with anti-Semitism, dalliances with foreign opponents and the refusal to terminate terrorism, embrace socialism and wholesale rejection of economic reality. "I reject socialism as an economic system," Pelosi told "60 minutes." "If people have that opinion, that is their view. It is not the view of the Democratic Party." Pelosi may be correct that it is not the perception of the majority of the Democrats in the House and in the country as a whole, but between the media and the public melting of, as well as, five people in Congress, the story has become her. Pelosi may say that she acknowledges Guaido as Venezuela's legitimate president, but Omar is still inexplicable at the prestigious Foreign Affairs Committee of the household, even after rejecting the Venezuelan will. Pelosi may say she opposes socialism, but Ocasio-Cortez is still sitting at the House Financial Services Committee. Pelosi may say she denies Omar's anti-Semitic rhetoric, but she still allows five people to devour a resolution condemning Omar's anti-Semitic rhetoric to the point that it became a dusk. And Pelosi still poses on the magazine covers with them, of course. Pelosi has two options: pick up and take back his party, or just hand 2020 to the Republicans.